Fall is in the air in upstate NY, meaning two things. One, I am officially freezing cold all of the time. And two…time for vegan comfort food! Of course I’m much more excited about the latter than the former. Big bowls of soup and stew, warming chilis, and stuffed food of all kinds are on the horizon for the QV household as fall turns to–gulp–winter. We’ll probably eat a lot of potatoes, too. But I started with stuffed squash. Stuffed squash from this recipe, to be precise. More Internet cooking! I came home from the store a couple of weeks ago with an acorn squash and could have sworn I had something bookmarked that would do it justice. 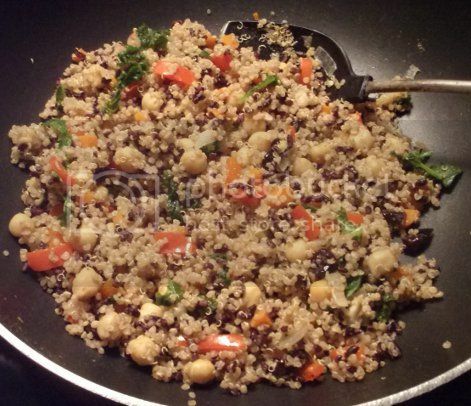 Lo and behold, there was that post on Chic Vegan, full of quinoa-y goodness and just waiting to be cooked. Dramatic? I think not. Fall is the perfect time for stuffed food. Not so hot that you melt in the kitchen while everything is cooking, but not so cold that you have to be bundled in six layers just to set foot in a room without a space heater. 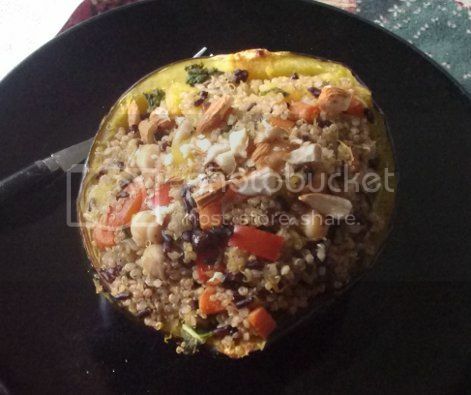 I’ve made stuffed acorn squash before, but never with quinoa. 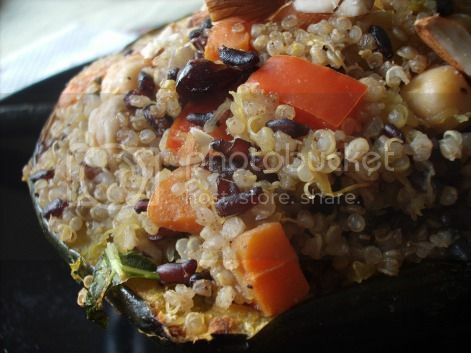 And quinoa, as vegans know, is magical. Its presence somehow elevates a recipe to new heights, plus it smells pretty darn amazing when its cooking. This recipe combines quinoa’s mystical qualities with a bunch of tasty veggies, crunchy almonds, and the sweet tang of dried cranberries. Come to think of it, this would probably make a good dish for Thanksgiving. It’s definitely way easier to make than the omni standard, and better for you! Oh, and it also has kale. Quinoa and kale in the same dish goes way beyond magic. There wasn’t a whole lot of tweaking that needed doing here. The biggest change I made was to use forbidden rice instead of wild rice. Never having had wild rice straight up, I can’t say how this differed from the original, but I liked the resulting flavor. Forbidden rice is very nutty and has a neat purple shade when it cooks up, making it a good complement to quinoa in both taste and color. This is one of those recipes that makes a lot of food. And I mean a lot. Even after reducing a couple of the ingredients and stuffing the squash as full as I could get it without making a mess, there was a bit of filling left over for lunch the next day. It tasted lovely both ways, but there’s something about scooping forkfuls of warm filling out of a veggie “bowl” with an edible interior that resonates with fall weather. It doesn’t make the chill go away, but it certainly takes the edge off! Question for the comments: What dish is the embodiment of fall for you?